The common English name, “the Forbidden City,” is a translation of the Chinese name Zijin Cheng. The name "Zijin Cheng" is a name with significance on many levels. Zi, or "Purple", refers to the North Star, which in ancient China was called the Ziwei Star, and in traditional Chinese astrology was the abode of the Celestial Emperor. The surrounding celestial region, the Ziwei star, was the realm of the Celestial Emperor and his family. The Forbidden City, as the residence of the terrestrial emperor, was its earthly counterpart. Jin, or "Forbidden", referred to the fact that no-one could enter or leave the palace without the emperor's permission. Cheng means a walled city. Today, the site is most commonly known in Chinese as Guangdong, which means the "Former Palace." The Forbidden City was surrounded by a ten-meter-high city wall and enclosed by a moat of 52 meters wide. At each corner of the city wall, there is a magnificent watchtower. Once inside, visitors will see a succession of halls and palaces spreading out on either side of an invisible central axis. It is a magnificent sight, the buildings' glowing yellow roofs against vermilion walls, not to mention their painted ridges and carved beams, all contributing to the sumptuous effect. The southern portion of the Forbidden City treats the Hall of Supreme Harmony, Hall of Central Harmony, and Hall of Preserving Harmony as centers. These are flanked by the halls of Literary Glory and Military Eminence. It was here that the emperor held court and conducted his grand audiences. 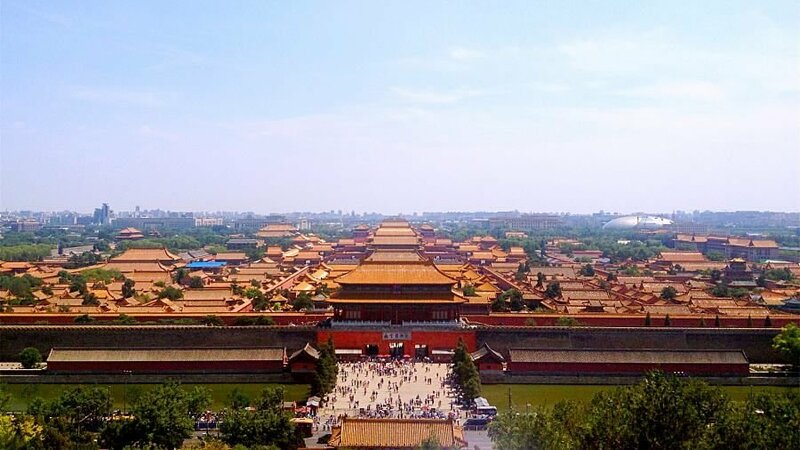 The northern end of the Forbidden City treats the Palace of Heavenly Purity, the Hall of Union, and the Palace of Earthly Tranquility, the Six Palaces of the East and West and the Imperial Garden as centers. Other major buildings include the halls for Worshipping Ancestors and of Imperial Splendor on the east, and the Hall of Mental Cultivation, the Pavilion of the Rain Flowers and the Palace of Benevolent Tranquility on the west. These contain not only the residences of the emperor and his empress, and consorts and concubines but also the venues for religious rites and administrative activities. These buildings were arranged precisely in accordance with a code of architectural hierarchy, which designated specific features to reflect the paramount authority and stand of the emperor. The Forbidden City was the Chinese imperial palace from the Ming Dynasty to the end of the Qing Dynasty. Located in the center of Beijing, it is 960 meters from north to south and 750 meters wide from east to west, covering an area of 72 hectares and a total floor space of 150,000 square meters. For almost five centuries, it served as the home of the Emperor and his household, as well as the ceremonial and political centre of Chinese government. 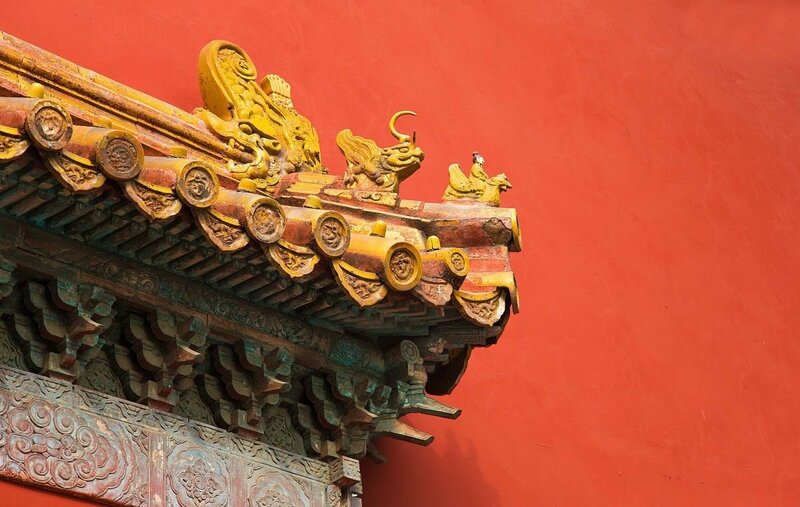 In the Forbidden City, fourteen emperors of the Ming Dynasty and ten emperors of the Qing Dynasty lived and ruled China here for as long as 490 years from 1421 to 1911. When the 1911 Revolution broke out to overthrow the Qing Dynasty, the last emperor Pu Yi was driven out of the palace in 1924. Afterwards, it was converted into the Palace Museum and has been open to the public. Now the Forbidden City is not forbidden any more, but welcomes visitors from all over the world. The palace complex exemplifies traditional Chinese palatial architecture, and has influenced cultural and architectural developments in East Asia. The Forbidden City was declared a World Heritage Site in 1987, and was listed by UNESCO as the largest collection of preserved wooden structures in the world.